If you’ve seen many World War Two thrillers about strategic bombing, you’ll know that precision, precision, precision is the goal, and smart bombs as a military technology have been in the public imagination since their first successes in Afghanistan and later in the first Gulf War, and ever since. Think on an incredibly small nanoscale and down to the pests that threaten crops instead of the bad guys that threaten civilization, and the same transition from carpet-bombing to precision bombing is underway, and TechAccel – one of those accelerators worth paying attention to – is all over it. Just like bombing in the military world, you need the weapon, a delivery mechanism and a high-throughput manufacturing capability. Same with pests. What makes the effort to transform pest control particularly interesting at this moment in history is that one small-ish but highly-regarded technology accelerator, has taken on the entire supply chain — weapons, delivery and heavy manufacturing — in a signature series of investments and company formation. And, for those who are special fans of the fast-developing world of genetics, in the area of weapons development, TechAccel has formed a company to exploit the relatively new and certainly far-out world of RNA interference, known in the community as RNAi and easily pronounceable only by Norwegians. There are a thousand interesting things about RNA, but here’s the one you need for this story. Your DNA creates RNA in order to express your genetic code — so, if you have, say, green eyes, those genes are written in DNA but get translated into RNA before any tissue is actually produced and that green color shows up in your iris. Interfering with RNA makes it possible to suppress genes without actually changing the genetic code. It’s like removing the switch instead of re-writing the circuit. It’s starting to sound a little like modern cancer therapies, isn’t it? In the old days, with traditional chemo and radiation, the aim was to try and kill any rapidly dividing cells, which absolutely kills more cancer than regular cells, but you can get those really bad side effects. Something more mundane might be the use of antibiotics, which also takes a sort of carpet bombing approach — along with the bad bacteria the treatment is aiming at, there can be other, useful microbes caught in the crossfire, and that’s why, for example, people can get gastro issues when they take antibiotics. If we could hit the bad bacteria and not the good ones, then we wouldn’t get out of balance. As it is with you and your microbiome, so it goes, more or less, with pests in the plant biome. Smart bombs allow us the opportunity to hone in on the target. Accordingly, it’s big news that TechAccel launched a new company out of their acceleration chambers — this one is RNAissance Ag LLC, which holds the exclusive license to RNA-interference technology in partnership with the Donald Danforth Plant Science Center in St. Louis, MO. The new company will use the proprietary technology in the development of sprayable insect control measures. The near-term targets: chewers, beware. For a second, let’s rewind to our World War Two analogy, that you need high-throughput manufacturing and a delivery mechanism as well as the actual weapon. 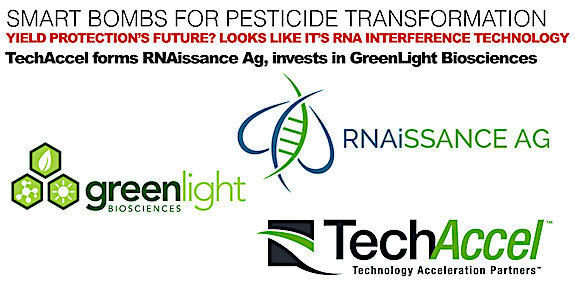 TechAccel also announced it participated in GreenLight Biosciences Inc.’s latest funding round, with an interest in collaborative research leveraging GreenLight’s technology in advancing biopesticides. GreenLight Biosciences, based in Medford, Mass., is a biotechnology company developing bioprocessed RNA products for healthcare and agriculture applications, including biopesticides. The company announced its $50 million Series round last month. There’s been an awful lot of chat about precision over the years, and the FAO tells us we’re going to have 10 billion people by mid-century and precision ag is part of how we are going to produce the food, feed and fuel. A lot of that has been in electronics, and Case and John Deere have been active there, with GPA technology, for one, allowing precision planting and application. Monsanto bought Climate Corp and there have been other big and small deals, enough to see that companies like Indigo, the Novozymes/Monsanto BioAg Alliance are a wave of the future. But, more than planting density and precision application of nutrients — there’s an entire effort we might see based around more intelligence — being able to see the plant biome as a whole system rather than simply a plant stuck in the soil. This is not just about organic farming and pricey but chemical-free lettuce at the store where rich people go. It’s about a broader renaissance based in gathering data and assessing strategies to assist the biome to produce more of a target product without compromising the biome’s long-term viability or creating side effects because of carpet bombing approaches that burn the good villages along with knockin’ out the bad guys. • Continuing development of a separate, novel RNAi biopesticide approach based on research underway in Europe. TechAccel, LLC, was founded in 2014 as a first-of-its-kind venture and technology development company in the agriculture, animal health and food tech sectors. TechAccel sources, invests in and acquires early-stage innovations. Through collaborations with universities and research institutions, TechAccel conducts advancement and de-risking research and development to ready technologies for commercialization. More on the story: visit www.techaccel.net or follow @Tech_Accel.